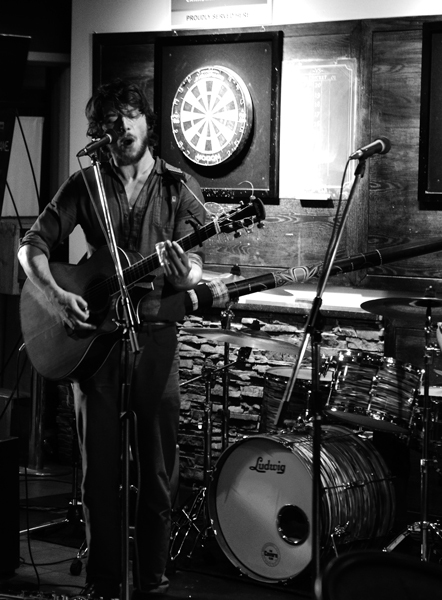 For Matt Remenda, playing an album release party in Prince Albert was the right thing to do. Remenda, bandleader, guitarist and vocalist of the Matt Remenda Ensemble, lives in Saskatoon. But he grew up in Prince Albert. It’s where, at 11 or 12 years old, he first picked up a guitar and started playing and writing music. Saturday, he came home. Along with fellow Prince Albertan Nathan Abramyk and Saskatoon-based musicians Cameron Baribeau and Michael Stankowski, Remenda showed off what he’s been working on over at Mosaic Music in front of his hometown fans at the Rock and Iron. “It’s roots and folk at its core, but has a lot more dirt in it,” Remenda said of his music. While this project is relatively new, the bandmates aren’t to each other. All four play in Saskatoon in various line-ups that cross over at various venues in the city. Nathan and Matt have played in various bands over the years, while Cameron and Michael went to high school together. “We have a lot of crossings between each other, but as the ensemble, we’ve only played together for two shows,” Remenda said. They’ve been picking away at the album since June, recording it at Mosaic Music. In the meantime, the band, in various iterations, continues to perform at open mic nights and other shows in the Saskatoon area. So far, the reception is positive. “Everybody’s been super supportive. It’s just been a dream beyond measure, Remenda said. It’s clear the band has a ton of respect for each other. It’s as much about the musicianship as the music. “Matt is the humblest bandleader I’ve ever worked with,” Baribeau said. Remenda gave the compliment right back. ‘These three players are some of the best Saskatoon has to offer,” he said. With the hometown concert behind him and two more album release parties on the way, Remenda is looking to the immediate future. “The plan is to get the album cemented, so we’re taking out a lot of the new tunes to run them around,” he said. He hopes to put out more music in about six months or so. But to be able to debut what he’s done so far at home was special. “It felt right,” Remenda said.